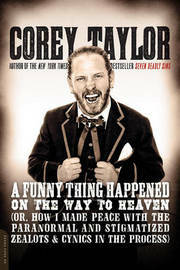 Corey Taylor has seen a lot of unbelievable things. However, many of his most incredible experiences might just shock you. For much of his life, the Grammy Award-winning singer of Slipknot and Stone Sour has brushed up against the supernatural world. Those close encounters impacted his personal evolution just as much as headlining at Castle Donington in front of 100,000 people at Download Festival or debuting at #1 on the Billboard Top 200. Since growing up in Iowa, his own curiosity drew him into situations that would've sent most people screaming scared and running for the hills. He's ballsy enough to go into the darkness and deal with the consequences, though. As a result, he's seen ghosts up close and personal, whether while combing through an abandoned house in his native Iowa as a child or recording an album in the fabled Houdini Hollywood Hills mansion. He's also got the memories (and scars) to prove it. For some reason, he can't seem to shake these spectral stories, and that brings us to this little tome right here...A Funny Thing Happened on the Way to Heaven compiles Taylor's most intimate, incredible, and insane moments with the supernatural. His memories are as vivid as they are vicious. As he recounts these stories, he questions the validity of religious belief systems and two-thousand-year-old dogma. As always, his rapid-fire writing, razor-sharp sense of humor, unbridled honesty, and cozy anecdotes make quite the case for his point. You might end up believing him or not. That's up to you. Either way, you're in for a hell of a ride.